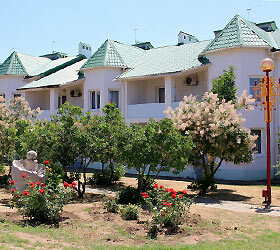 "City Chess" hotel complex is located in a picturesque spot of Elista. The city centre can be easily reached by taxi, and guests who prefer to travel by a personal car will be provided with secured parking. The complex cottages can accommodate 180-200 people. Guestrooms of various categories are available for single, double, triple and quadruple accommodation. All rooms have telephones, TVs, fridges and air conditioning. Each room features a bathroom with shower, kitchen with gas or microwave oven, tableware, upholstered furniture and single or double beds. Breakfast, lunch and dinner are available at the hotel restaurant. Flamingo restaurant has three halls - Corean, European and Kalmyk, bar, dance hall and open terrace with outdoor swimming pool. Those who prefer active recreation can avail of billiards, tennis court, ping-pong, badminton, volleyball and mini-footbal fields. For added convenience the hotel houses a store and a laundry.